The venue is probably THE most important thing you'll choose for your wedding day (other than your husband/wife to be - of course). Choose a grand manor house for a formal and traditional day, a chic city hotel for a cool contemporay vibe, a countyside rustic barn for a relaxed, knees up affair... the venue is the ultimate indication of the type of day you're going for. 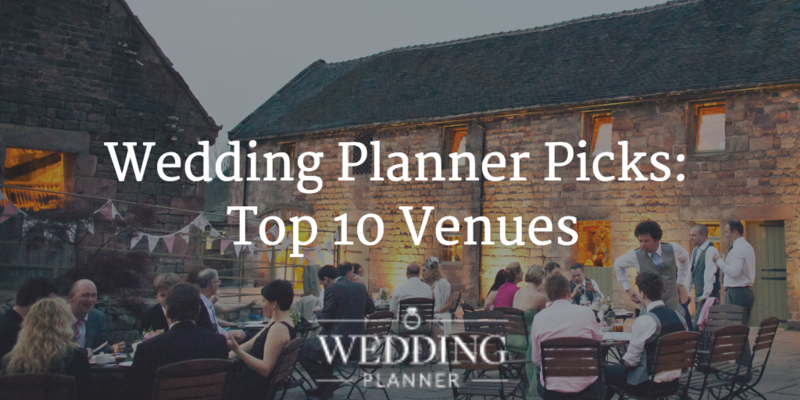 Click here to see the venues we currently have listed with us at Wedding Planner. Each of our venues have their own unique quirks and charms, and we have pretty much something to suit every taste (even a Football loves museum!). Use the enquiry form on the right hind side of the page to request a brochure, arrange a viewing or just to check if they have your date! Clearwell Castle is set within the stunning Forest of Dean and provides the perfect fairy tale setting for your wedding day dreams to come true. Located in Gloucestershire it is just 20 minutes from the Severn Crossing and 45 minutes from Bristol, Cheltenham and Gloucester making it easily accessible from all directions. The castle is yours exclusively for your wedding, and all 15 beautiful bedrooms are reserved for your guests. Why we love it? This is the ultimate fairytale castle - the ballroom, the lawns, the luxurious bedroom suites, it's a show stopper for sure! They also offer incredible 2 day wedding packages, with pre-wedding dinners and activities! The Ashes is an incredible exclusive use barn wedding venue set in fifty acres of rural Staffordshire countryside at the foothills of the Peak District National Park. With exclusive use guaranteed and NO corkage, this really is your space to enjoy as you see fit. Why we love it? Unspoilt views across the Peak District make this a stunning location for photos, and the team here go above and beyond to make sure everything runs to plan. And can we say again, no corkage! Wahoo! Devonshire Terrace in Devonshire Square offers a unique surrounding in the heart of the City of London to create the ideal venue for your wedding. Steeped in history, Devonshire Square was built in the early 1800s and was used as warehouses to store goods shipped from Bengal including silk, ivory and mother-of-pearl. The original façade is the soft yellow of18th century London stock brick. Why we love it? Wedding Planner HQ is just arround the corner from this fabulous space, and every time I walk through it I find myself in awe of the high ceilings and light drenched terraces. To have access to it privately for a chic city wedding would be a DREAM! Kinnettles Castle is a fully licensed civil ceremony wedding venue, situated near to Dundee & Forfar. With its fairy tale turrets, stunning black and white interiors, grand gardens and parklands, Kinnettles Castle is a wedding venue so perfect that it’s hard to believe it’s not a figment of your imagination. Why we love it? A romantic, secluded castle, with it's own private beach? Wow. It doesn't get much more intimate and fairytale than this! The Green is a stunning venue set in a private estate in the heart of Cornwall with stunning views in all directions. They offer weddings of various sizes from just the 2 of you in a cosy cottage, up to 20 guests in The House or have the whole place for 3 nights with 120 guests and accommodation for 32. Relaxed and origina,l or traditional and formal: The Green can be whatever you want for your perfect. Why we love it? Formerly a dairy farm, the house and barns have been restored with a charming and contemporary vibe. There's very much a vibe that you can have your day your way - from outdoor ceremonies, to relaxed self-catered house weddings. Pretty chill! Whether you are looking for a grand occasion or a more intimate affair, Goldsborough Hall is a Wedding Venue that is both unique and unforgettable. After all, what could be more special than the private use of a royal stately home for your wedding day? Nestled in the Yorkshire countryside, this venue goes above an beyond to create a truly bespoke wedding day, catering to your every need! Why we love it? This house was well known as being the home of HRH Princess Mary in the 1920s, and has been lovingly restored in recent years by it's current owners. It has such charm and warmth and we love how it remains to be a family home as well as an exclusive wedding venue and B&B! Iconic London landmark? Tick! What an insane place to have your wedding! The high-level Walkways and the North Tower Lounge are licensed for weddings and civil partnership ceremonies and offer idyllic sceneries to tie the knot and to celebrate with family and friends. Wedding packages to hold both a ceremony and evening reception at Tower Bridge are also available. Why we love it? If you're doing a London wedding, you may as well go all out! It's such a cool contemporary space within one of the city's oldest landmarks, which is quite a unique juxtaposition if you ask me! Compton Verney in Leamington Spa offers a beautiful setting, for either an intimate ceremony and reception with close family and friends, or a lavish mansion house affair. Recently included in Brides Magazine top 100 wedding venues, you get to choose from a range of beautiful spaces, from the spectacular Adam Hall with its marble floor and ornate ceiling, to one of the more intimate gallery spaces for your civil ceremony, wedding breakfast or reception drinks and photographs. Why we love it? Compton Verney's 'day job' if your like, is actually a gallery and community space. They're a registered charity aimed at providing some cultrual education for the local community. One of the ways they raise vital funds is by hosting weddings and events, meaning your big day could have a much wider positive impact other than your resulting marriage! Cheers to that! Imagine yourself in a beautiful and tranquil outdoor haven, steeped in history but RIGHT in the heart of Bloomsbury, London. Combine this with an array of impressive rooms, gormet food, fine wines and superb service making BMA House a hidden gem that offers everything you've ever dreamed of for your big day. Why we love it? Once inside the gates you'd have no idea you're right in the middle of the busy capital, a stones through from incredible transport links and hotels for your guests! The whole house is exclusively yours for your entire stay under the guiding principle of ‘your stay, your way’. Devon's Huntsham court is one of the country’s biggest but most intimate venues: almost everyone (up to 80 people) can sleep under one massive roof in vast bedroom suites meaning you have an incredible house party with the wedding as a focal point and then all the fun of having morning coffee together in your PJs, secret midnight stacks as well as the big formal moments! Why we love it? Hello no corkage and late night partying! Need we say more?